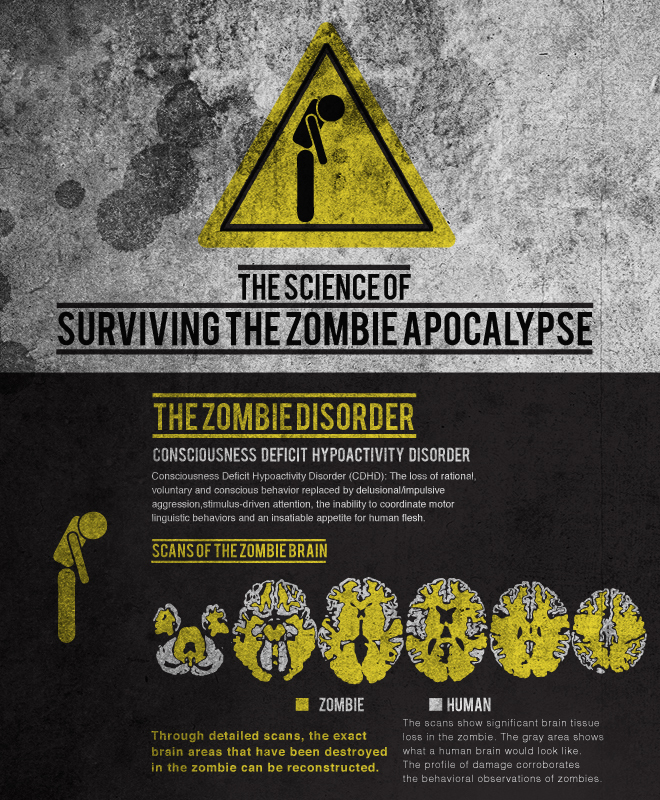 A few weeks ago I answered a question on Quora: What are some ways to survive the Zombie Apocalypse? Nerd Nite SF: "Scanning the Zombie Brain" by Dr. Bradley Voytek, 1/19/11 from nerdniteSF on Vimeo. Well, someone working with Pimsleur saw the video and Quora response and shot me an email asking if he could create an infographic on how our "results" inform ways in which we could survive the zombie apocalypse. In the mean time I'd been in touch with Angela over at Wired about doing something zombie-related, and this seemed like the perfect opportunity. I've talked at length on this blog about why I do the zombie neuroscience stuff: it's a tongue-in-cheek jab at cognitive neuroscience, it gets people to accidentally learn about the brain, and it's just damn excellent geeky fun! So far this zombie stuff has lead to an interview for National Geographic's The Truth Behind Zombies, my new article in Wired, speaking at zomBcon, and now speaking on two panels at Comic-Con. Like I said, if only my actual research lead to such opportunities! Zombies are really interesting things. When we were kids, we used to wonder why the movies always show human zombies and how it would look like to have a cat zombie or a dog zombie… then we progressed to predict behavior of ant zombies or mosquito zombies (and even wished to convert all the mosquitoes into zombie mosquitoes; you know it’s really soothing to imagine trapping those insects before they bite you!) Now ten years later, while searching for news to send via my friend’s health news channel I found that zombie ants do exist, with their behavior getting manipulated by infecting fungi! Then I found information about zombie cockroach zombified by sting of a wasp… zombies are really mystifying; I can’t call it as totally fake science, rather it’s fun science. The "zombie" bugs are pretty amazing. As a neuroscientist, it fascinates me that another animal--or even a fungus--can "take control" of the behavior of another animal. brainSCANr at the Human Brain Mapping conference!